Yesterday I received my first ever seeds of the newly described Lophophora alberto-vojtechii. These seeds are still rarely offered and consequently the price is quite high so I only bought one packet containing 10 seeds. I got the L. alberto-vojtechii (San Luis Potosi, Mexico) seeds from Gerhard Köhres who charges 16 euro (~ 24 USD) per packet. If you also want some of Köhres's Lophophora alberto-vojtechii seeds you can buy them from Lophophora.info (go to the "list" submenu) or from the online shop at Köhres Kaktus. It's too early to say anything about the quality of the seeds but the delivery was impressive; the seeds arrived only 3 days after I ordered them. 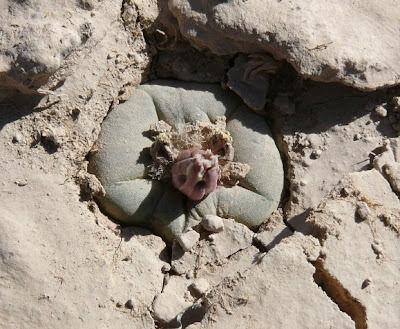 The photos featured in this post are from Gerhard Köhres's Lophophora.info site (go to the "habitat gallery" submenu). 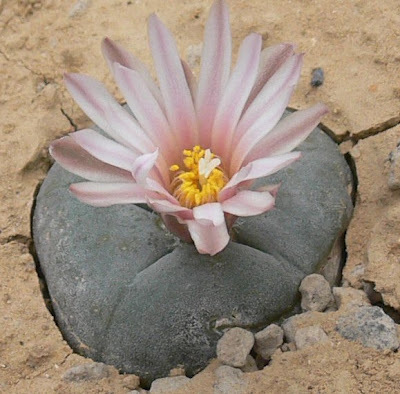 You can find the original pictures here and here along with more Lophophora alberto-vojtechii photos from the San Luis Potosi habitat. 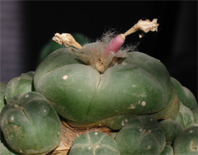 Can you list ALL the current vendors for Lophophora alberto-vojtechii seeds/plants? Currently Köhres is the only Lophophora alberto-vojtechii seed vendor that I know of. I have heard that seeds are also offered by Czech vendors but the ones I have contacted have none for sale. If you know about others selling L. alberto-vojtechii seeds I would be glad to learn about it. I have not seen any plants offered for sale yet.